If there’s one thing that Gatlinburg revolves around, it’s fun! So to celebrate our love of fun, we wanted to share with you the following fun facts about our little corner of the Smoky Mountains! On the Gatlinburg strip, you will find the Ober Aerial Tramway, a ride that will take you up to Tennessee’s only ski resort, Ober Gatlinburg. Accessible also by road, the ski resort doesn’t just offer winter fun, but also year around activities. During your visit you will find opportunities for dining, shopping as well as numerous activities. While at the top you can also take a ride on the mountain coaster, climb the rock wall, have fun on the water rides or let the kids enjoy attractions that are perfect for them! With a calendar packed full of special events, Ober is a must see destination while vacationing in the Smokies! Gatlinburg is home to numerous Ripley’s Attractions but one in particular has time after time received attention nationwide. The Ripley’s Aquarium of the Smokies sits in the heart of downtown Gatlinburg and with 10,000 sea creatures waiting inside it’s easy to see why it’s so loved by guests. Visiting the aquarium can easily be a full day adventure! Explore the exhibits, dine, play or sign up for a special experience like Splash with the Stingrays or go for a ride on their glass bottom boat. If you plan on adding this fun spot to your itinerary, be sure to check out the Ripley’s Combo Passes or even an annual membership that you can use on your next visit to the Smokies! 2019’s most talked about attraction in Gatlinburg can be found hanging above the city! The Gatlinburg Sky Lift is making an incredible comeback as they open up as the new SkyPark. The Gatlinburg Sky Lift will now take you to a new and improved SkyDeck, complete with dining and some of the most stunning views of the Smokies that you can find in town. If that’s not enough thrills for you then you can take a walk across the longest pedestrian suspension bridge in all of North America! The most stimulating part of the experience is when you reach the highest portion of the bridge and find yourself standing on glass-floor panels at 140ft. Regardless of if you’re going because you’re a thrill seeker or if this is your year to conquer that fear of heights, you’ll come back down with memories that will last a lifetime! The Great Smoky Mountains National Park is the most visited national park in the country and is in our backyard. 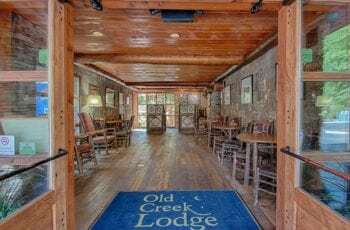 When staying with us at the Old Creek Lodge, you’ll be within walking distance of the Gatlinburg Trail, as well as just a short drive from many areas of the park. The park is filled with year around beauty and 520,000 acres for exploring. If you’re wanting to spend time in the most loved park in America, we are the perfect spot for your basecamp! You’ll find plenty of fun in Gatlinburg but coming in for a close second is the amount of love that fills the Smoky Mountain air! Sometimes referred to as the Vegas of the Smokies, Gatlinburg is filled with beautiful locations for proposals, chapels for eloping and romantic escapes for the perfect honeymoon. You easily pull off all three within our charming city! Celebrating an anniversary or just wanting to spend some time with your significant other? Gatlinburg has everything you need to set the scene for your very own Hallmark movie! 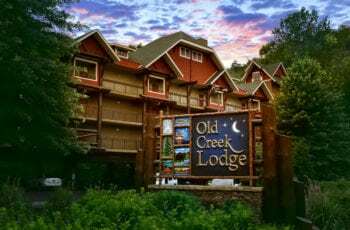 If you’re ready to start planning your next trip to the Smokies and want to learn more about our Gatlinburg hotel, Old Creek Lodge, click the link below!